The Spanish Flag is also known as la Rojigualda, roji – rojo- for red and gualda for the plant that tints a golden yellow. The Spanish flag has a yellow central stripe which is double the width of the two red stripes. 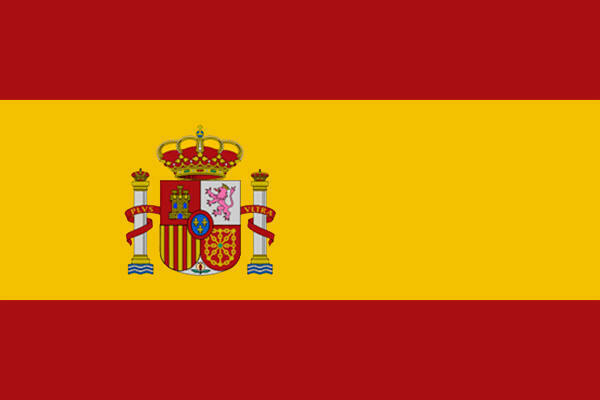 The Spanish flag used to be predominantly white, as that of many other European countries. When Charles III became King of Spain, in 1785, he realized that it was necessary to change the colors of the flag so as to not to be confused with enemy ships when at war. The King Charles selected the current red and yellow colors, that come from The House of Bourbon. The Spanish coat of arms is placed slightly to the left on the yellow stripe, on both sides of the flag. This shield has at the top the Royal Crown and the Pillars of Hercules on each side. The quarters symbolize the Medieval kingdoms that united form what we now know as Spain. These kingdoms were Castilla (castle), León (lion), Aragón (bars),Navarra (chains) and Granada (flower). At the center it has an oval with three fleur-de-lis which represents the House of Bourbon. The Spanish flag can only be flown horizontally from public buildings, homes, ships, town squares. *Spain is located in Europe and is part of the European Union.